It’s no news that football player pocket huge salaries and wages and you’d expect a female list like this to be embellished with low paycheck unlike the male counterparts, you’re wrong if you did. Their ability to do things with their feet is not only to dance or twerk but do incredible things with the ball which doesn’t make them super-rich like their male partners. 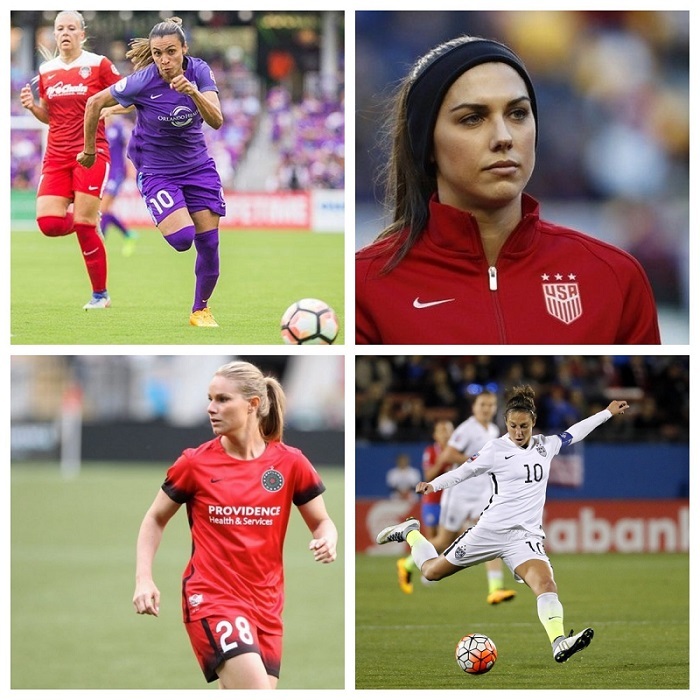 These female footballers are gorgeous as well as very rich and are pocketing huge paychecks, they make an impression in the footballing scene and that statement is power. CheapGoals have gathered and compiled reliable information of highest-paid and richest female footballer in the world as at 2017-19, who without a doubt earn mouthwatering pay-checks. Laure Pascale Claire Boulleau is a retired French football player who played for Paris Saint-Germain of the Division 1 Féminine. Boulleau primarily played as left-back and was a member of the France ladies’ national football team. The 32-year old earned her spot in the UEFA Women’s Championship All-Star Team in 2013. In the wake of finishing her university career at Rutgers University, Filigno signed for NWSL side Sky Blue FC where she made her debut on April 27, 2014, as a second-half substitute in a 3– 2 loss to the Boston Breakers and net her first professional goal in a 3– 3 draw against the Washington Spirit. The 28-year old midfielder made her senior international debut in 2008, at the age of 17. She played for Canada at the 2008 Olympics as well as the 2011 FIFA Women’s World Cup. After her appearance at the 2015 World Cup, she officially pronounced her retirement in 2017. Not only is she an amazing player but she is also one of the best goal keeper in female football scene. Dubbed as the most beautiful female football player, Hope Solo last played for the Seattle Reign FC in the National Women’s Soccer League which is the top division of women’ football in the United States. The two-time Olympic gold medalist, Solo, as of now holds the record for most number of clean sheets among the US players. Fischer is the highest scoring and most capped female soccer player in Sweden, the 34-year old debuted against Norway in January 2001, her potential was truly observed flourishing. Viewed as a standout amongst the most attractive female athletes, Football pundits lavish praises on Fischer for her captaincy stint with Swedish club LdB FC Malmö. Her stunning performance in Sweden’s raced to the semi-finals instigated an offer from the European Champions VfL Wolfsburg. The German-Cameroonian soccer star is widely viewed as one of the best female football players of all time. The 30-year old midfielder is currently playing for Swiss club FC Basel. However, she earned most accolades amid her time with Bundesliga ladies’ club SC Freiburg from 2014 to 2017. She made her international debut with the German national team on 7th March 2008 against Finland. Banecki also played for the Germany national team at the 2008 FIFA U-20 Women’s World Cup finals in Chile. Henry is an influential midfielder who plies her trade with Ligue 1 giants Olympique Lyon. Her team has become a colossus in European football and it’s down to their strong force to secure the signature of world-class female players like Amandine Henry with an awesome paycheck to smile on. The 28-year-old Frenchwoman was integral to Lyon when they started dominating Europe in 2007. She, nonetheless, left for the United States where she refined herself into becoming a world-class genius. She came back to France to join Paris Saint-Germain but was before long poached by Lyon. She has helped OL win three Champions League titles. Despite the fact that she hung her boot in 2013, Heather Mitts still makes our list of the highest-paid and richest female footballer. The retired US soccer star earned commendations for being a standout amongst the best defender in her primes. She used to play school soccer for the University of Florida and discovered her niche in soccer at first. From that point onward, she played professionally in the Women’s Professional Soccer league for the Philadelphia Charge, Boston Breakers, Philadelphia Independence as well as the Atlanta Beat and the United States national team, also clinching three Olympic gold medals. Abby who is more of a mature, distinctive driven woman out there and hones a similar measure of trustworthiness and principles to other female players even out on the field. She earns around $200,000. Abbay had a significant successful career as Female Soccer player. She has also won Gold Medal in Olympics two times. Presently she is the head coach of the US women national team. A year ago, she became the highest-paid female footballer when she joined Lyon on loan from Orlando Pride. It was reported that the American earned at least $40,000 monthly amid her loan spell with the European Champions. Morgan, 29, is the model face for US ladies’ football. In 2012, she helped her nation win the football gold award during the London Olympics. Morgan featured for the United States in their successful 2015 FIFA World Cup. Orlando Pride has since welcomed her back from her brief spell in Europe. She accepted a decrease in salary. That hasn’t pushed her down the list of highest-paid female footballers. The Olympic gold medalist still wins $300,000 yearly. With endorsement deals and bonuses, she earns considerably more. Marta unquestionably has more to offer as a female football player in regards to her talent, and professional expertise as well. Her football aptitudes and skills have been completely astounding, Tried and tested to be a champion among the most talented in her category, and other female footballers’ regard her as being one of, if not the best female players in her own unique way. A Brazilian with skills to rouse an audience, Marta’s career has been a success story overcoming adversity. She’s racked up more individual titles than the vast majority of her contemporaries. Like Lionel Messi and Cristiano Ronaldo, she’s won the World Player of the Year five times. With 17 goals to her belt this season, Marta is the record goalscorer at FIFA World Cup competitions. At 33, she’s still making things happen for her American club – Orlando Pride. She earns a cool sum of $25,000 monthly wage; making Marta the highest-paid female footballer in the world.